See more at the Benefits to authors. 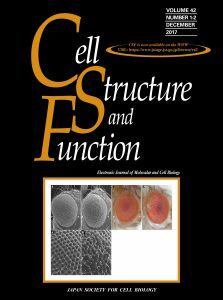 Cell Structure and Function publishes important, original contributions in all areas of molecular and cell biology. The journal welcomes the submission of manuscripts on research areas such as the cell nucleus, chromosomes, and gene expression; the cytoskeleton and cell motility; cell adhesion and the extracellular matrix; cell growth, differentiation and death; signal transduction; the protein life cycle; membrane traffic; and organelles. The journal publishes five article types: Full Articles, Short Communications, Mini-Reviews and Reviews, Technical Notes and Perspectives. Full Articles and Short Communications report original research not published elsewhere. The remaining article types can be summaries of previous research, but must add important insight or a fresh perspective. The audience of Cell Structure and Function includes research scientists in academia or industry who work on cell biology or related life sciences, individuals working on the application of research in these fields, clinicians, students and other interested individuals. The journal strives to be an important outlet for the publication of excellent research and an essential part of communication in molecular and cell biology. Manuscripts should be written in clear, grammatically correct English. Author(s) whose native language is not English are strongly encouraged to have their manuscript checked by a native English speaker or by services such as those at INLEXIO prior to submission. If a manuscript is not clear due to poor English, it may be rejected without undergoing peer review. The Editorial Board comprises an Editor-in-Chief and an Editorial Board of experts in cell and molecular biology from around the world. THe Editor-in-Chief is Hiderou Yoshida, who is Professor of the Department of Biochemistry and Molecular Biology, Graduate School of Life Science, University of Hyogo in Japan. The Editor-in-Chief allocates submitted manuscripts to an Associate Editor, who acts as the Monitoring Editor in charge of peer review. The Monitoring Editor selects two appropriate reviewers to provide their assessment of the manuscript. Once their reviews have been received, the Monitoring Editor decides whether the manuscript requires revision. Authors who are asked to revise their manuscript must do so within two months, otherwise it will be treated as a new submission. The Editor-in-Chief makes the final decision on each manuscript based on the Monitoring Editor’s recommendation. The 2016 Journal Impact Factor of Cell Structure and Function is 2.391, placing it 130th of 192 journals in the ‘Cell Biology’ category (Clarivate Analytics, Journal Citation Reports © 2018). Further bibliometric information is available at the Metrics page. Cell Structure and Function is fully indexed in MEDLINE and PubMed; Chemport (CAS); Clarivate Analytics products such as Science Citation Index Expanded, Web of Science and Journal Citation Reports; Elsevier’s Scopus; SCImago; Directory of Open Access Journals (DOAJ); and other relevant databases. Cell Structure and Function has a range of journal policies on authorship, confidentiality, conflicts of interest, experimentation, image integrity, unoriginal material and more, which are detailed in the Instructions to Authors. The journal follows the Committee on Publication Ethics (COPE) guidelines to manage cases of potential ethical concern. To support the Open Access publication of Cell Structure and Function, the journal charges a modest publication fee (Article Processing Charge) of ¥100,000 for all article types except commissioned Reviews and Mini-reviews, which are free to publish. Cell Structure and Function uses ScholarOne to handle manuscript submission and peer review. Please ensure your manuscript adheres to the journal’s Instructions to Authors before submitting via the journal’s ScholarOne site.